The good news is, you are not alone if you sustain an injury - or want to avoid one - during the winter. The bad news is that these injuries or accidents can arise at any moment, especially during otherwise low-risk activities, when winter weather is involved. And if you live in New Jersey or the Northeast, you remember how many winter weather events we have been experiencing in recent years! The great news, however, is that with these tips, you will be prepared - whether you are seeking to avoid injuries or want to know how to recover if you have an accident. Did you know that during the winter months, nearly a half of a million people visit orthopedics each year due to weather related car accidents? In the suburbs of New Jersey, we all know hope everything closes down during winter weather events. This is because we have all heard about poor driving conditions that arise during snow, sleet, hail, or ice. These conditions also exacerbate the incidence of drunk driving accidents (due to lack of proper awareness or reflexes, and an increased amount of holiday parties) or trucking accidents (due to lack of visibility and lack of control). So the best thing you can do during a snowstorm is to stay at home and avoid driving. But the reality is, most of us continue with our work or daily lives even during the snow. Also, keep in mind that although snow plows significantly help to remove the bulk of snow from the streets, they do pack down the snow and can cause this to freeze in cold temperatures or overnight. If you must go out during (or right after) a snowstorm, make sure you travel during the sunlight to avoid any ice that may accumulate during the dark and cold night. Stick to main roads (which usually have less snow due to the warmth of many cars passing over). Leave enough space between you and other cars. Go slow (some laws even go so far to state you must travel 10 MPH below the speed limit). Don't make any sudden stops, which may cause you to skid out on the slick surfaces. 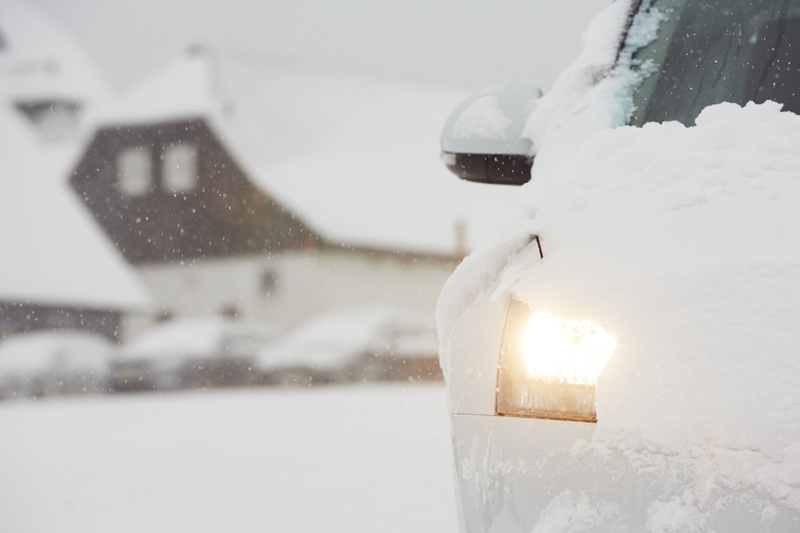 Avoid wet spots, which look innocuous but could actually be "black ice." And maybe, invest in some snow chains or tires if you want to feel more comfortable and secure on the snowy, icy, and slushy roads. Every year, we all hear a devastating story about a senior citizen that slips and falls on ice. And although this is a common cause for seniors' winter injuries, the reality is that any of us could fall victim to a slip and fall on ice. To prevent ice from forming in the first place, consider coating your sidewalk and steps near your home in sand or salt. If ice does form, make sure you wear weather appropriate shoes whenever you must leave the house. If you see an icy spot on the sidewalk, step off into the snow (if not too deep) to gain more traction. Use stairs and walkways with railings, when possible. And take small, careful, light steps, and avoid taking fast-paced long strides. One of the most common causes for winter weather-related injuries is shoveling snow. We all know how dreadful the task is - leaving the warmth and comfort of your home to do some heavy lifting, especially when dressed like a snowball. But did you know the most daunting fact of all? - nearly 12,000 people visit the emergency room each winter as a result of shoveling related injuries. Luckily, you have a lot of options when it comes to avoiding shoveling related accidents. First, you can help boost the local economy by supporting the local teenagers to shovel for you. You can get the whole household involved, in order to "divide and conquer" - and avoid getting tired quickly, which is when most injuries occur. Or, you can invest in a small snow blower, which significantly helps to lighten the load - literally. With a snow blower, you only have to shovel a little off the surface (if at all) and allow the snow blower to do the rest. To make the winter seem less brutal, we often engage in winter activities like sledding, skiing, snowboarding, ice-skating, snowshoeing, ice fishing, or snowmobiling. But these can be some of the most accident-prone sports you can play. That is not to say you should hold yourself back from enjoying these seasonal activities – you just need to be prepared, so that if an accident does occur, you mitigate the damage to your body. Wear helmets when you ski or snowboard, and even during sledding. Prepare for outdoor sport activities through stretching and conditioning. Stay hydrated to avoid cramping (which makes you more injury-prone). Avoid wearing goggles with polarized lenses, to differentiate between ice and snow on the slopes. And go so far as to wear knee pads and padded gloves when ice-skating or playing hockey, this way you can cushion your fall. One under-looked cause for injury during winter months is the freezing, cold weather. Seriously - lack of weather-appropriate attire plays a big role in many “injuries.” Dress in clothes and accessories that are warm, insolated, and dry – don’t be afraid to look a little goofy. Frost nip – which occurs before frostbite – is much more common than you think. The culprit? – wet socks. Wear thick, weatherproof, insulated shoes and wool socks. Layer up. Wear gloves – there are so many options to allow access to your fingers (and smart phone). Wear a scarf to cover your neck, in order to avoid stiffening (which would make other injuries worse, as you are tense). Do some light stretches in the morning and before bed to prevent waking up tense, too. Neck and back injuries - caused by car accidents, falling on ice, muscle strain during shoveling, and winter sports. To prevent neck and back injuries, try to avoid driving in poor weather conditions (the major culprit for these type of injuries). Also, make sure your body is prepared for outdoor activities, even if is just shoveling. Stretching your body and dressing it appropriately is key. Wrist or ankle sprain and fractures – caused from falling on ice, shoveling, or winter sports. Twisting your ankle (on ice, for example) may cause you to fall (obviously) – but then wrist injuries typically follow, which are caused when trying to brace yourself when you fall. To mitigate wrist injuries, prepare in advance by stretching your wrists (not only would this make your wrists more flexible and less likely to sprain during a fall, but also they would feel therapeutic after a day-long off typing and texting). Elbow pain, knee injuries – caused by car accidents, slipping on ice, or strain from shoveling. Joint injuries in the elbows and knees can put you out of commission. Again, avoid driving during snow or when it is icy, especially at night when there may be drunk drivers on the road after holiday parties. Dressing for winter might seem inconvenient (all of that heavy and puffy clothing, with all of those accessories you’ll lose), yet it is essential to surviving the winter. Not only can it provide comfort and warmth, but also it can help prevent some of the most easily avoidable winter injuries. Scarves, gloves, warm wool socks, weather-appropriate boots (with good grip, to boot) can help you prevent these common winter injuries. Maybe even keep an extra pair of all of these in your car or at your office. Heart attacks – caused from over-exerting oneself during shoveling. A surprising amount of heart attacks occur during shoveling. As discussed above, avoid shoveling injuries – and heart attacks – by hiring someone else to shovel or lessen your load through using a snow blower. Although some of the most common causes for winter accidents and injuries are avoidable, some things just can’t be avoided. For example, you may find yourself the victim of a winter accident such as an automobile accident or slip and fall on someone else’s property. If that is the case, contact a New Jersey personal injury attorney today to see how you can make a full recovery.